The AS Womyn’s Commission is an assembly dedicated to advocating womyn’s rights and doing work that acknowledges these issues within our campus and community. “We need to remind our community that beauty is beyond skin deep, and that we should be able to compliment ourselves without feeling conceited or narcissistic,” said Rosina Saeed, co-chair of the commission. The night opened with a brief introduction that discussed the necessity for our minds to be retrained on the topic of body image. Audience members were encouraged to challenge body dysmorphia and raise a voice against the media’s typical portrayal of generated beauty. Co-ed a cappella group InterVals kickstarted the night, delivering an enthusiastic rendition of “Party In the U.S.A.” that fueled the event with contagious energy. Soon after, the actual runway portion of the show was started. This event was particularly empowering due to the open invitation for anyone to get up and strut down the catwalk. Audience members were encouraged to participate in a fully equipped t-shirt decorating station to paint messages of self-confidence and strength. Event-goers were sprawled out on the carpet with puffy paints and glitter, wielding paintbrushes and creating messages of inspirational confidence. Second-year film and media studies major Ashley Baker fashioned a t-shirt that read “F*ck the system,” representing another issue that the commission addressed through the event: a call to challenge patriarchy and put a stop to the obsessive tactics dedicated purely to creating a socially-expected pleasing aesthetic in women. The night was undoubtedly a celebration. As each and every person walked down the runway with their own individualistic saunters, the applause and support radiated throughout the room. The positivity and energy was exhilarating; friends and strangers alike were cheering for every single person who wanted to present themselves on the runway. The most common phrase being cheered was “You’re so beautiful,” which solidified the overwhelming feeling of love and acceptance. 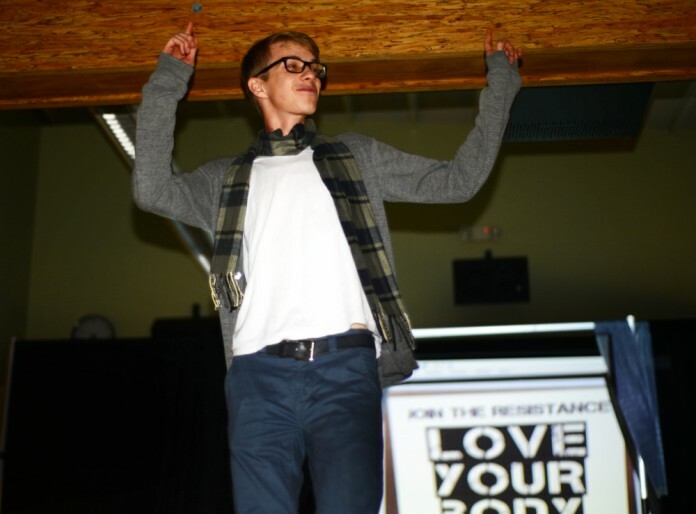 The entire runway was backdropped with a powerpoint presentation displaying statistics about eating disorders and body image. Adding a thought-provoking perspective, these facts helped push the message that there really is no wrong way to have a body. Liberation, joy, and poise–key to the night’s success–were embodied by the participants of the event and the refreshing attitudes of the entire AS Womyn’s Commission. The event, and the awareness of optimism and sisterly support that it promoted, energized a triumphant night that allowed students to shine the spotlight on their own distinctive beauty.